Did you know that it costs us an average of $32 per cat that we trap, spay/neuter and vaccinate? On average, we trap 100 cats a month! Any donation you can give will be greatly appreciated. Kitten season is in full swing. Let us know if you are interested in fostering or would like to adopt kittens or cats from our fosters. Reducing the number of free-roaming cats and managing their care is the goal of Trap-Neuter-Return (TNR). 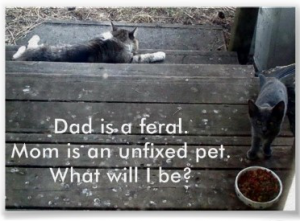 Victoria TNR is always looking for volunteers for helping foster kittens/cats and trapping. Let us know if you want to help. Victoria TNR has tame, healthy cats available for adoption from our fosters! Victoria TNR is private, 501(c)3 organization dedicated to improving the health and living conditions of homeless cats through trapping, neutering/spaying, and returning them to volunteer caretakers. As an all-volunteer organization, we are always looking for people who are passionate about helping animals. Whatever your talents may be, we will put them to good use! While TNR is less expensive than trap-and-kill programs, our operation involves many expenses such as spay-neuter subsidies, traps, gasoline, advertising, operations fees, office supplies, and cat food. As a 501(c)3, your donations to us may be tax-deductible.